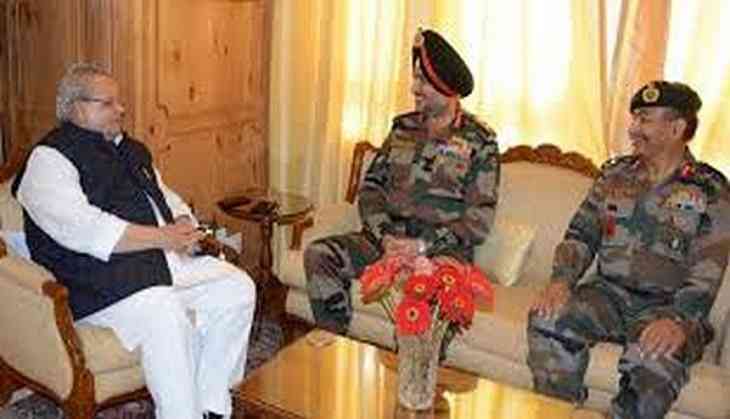 The Army Commander, Northern Command, Lieutenant General Ranbir Singh met the newly-appointed Governor of Jammu and Kashmir, Satya Pal Malik in Srinagar. The Army Commander was accompanied by Lieutenant General AK Bhat, General Officer Commanding of the Srinagar based 15 Corps. Earlier on August 28, Lt. Gen. Ranbir Singh had visited some areas along the Line of Control (LOC) and the hinterland in the Kupwara sector of Kashmir. He met the troops on ground and complimented them for their unwavering dedication, selfless devotion and high morale. The visit of the Army Commander came in the wake of an operation in the Kalaroos in the Kupwara area of Kashmir on August 25 in which the Army successfully saved four Kashmiri youth who were being exfiltrated to Pakistan-Occupied Kashmir (POK) by the terrorist organisation Al Badr. The troops, after trapping the misled youth who were being guided by three terrorists, exercised extreme restraint and gave an opportunity to them to surrender which they did. The terrorist deserted the boys and managed to escape since the security forces were concentrating more on getting the misled youth to surrender. Governor Satya Pal Malik had, in an interview with ANI earlier in New Delhi, placed interaction with people to understand their problems as high on his list of priorities. He has expressed a determination to weed out corruption from the state and give a boost to development. He has identified former Indian prime minister Atal Bihari Vajpayee's formula of "Insaniyat" (humanity) as the only way out and has stated his intent to follow the same as is being done by Prime Minister Narendra Modi. In the deadly attack on August, 29, around the time when the meeting between the Governor and the Army Commander was held, terrorists shot dead four policemen of Jammu Kashmir police while they were on duty in the Shopian district of South Kashmir. The attack is seen to be retaliation to the killing of the terrorist Altaf Ahmed Dar, a top commander of the terrorist organisation, Hizbul Mujahedeen, and his associate in Anantnag. 33 policemen have been killed by terrorist across the state in 2018. The administration will have to contend with terrorism along with its development and humanitarian agenda. Jammu and Kashmir, under Governor Satya Pal Malik , will face its first political test in the form of the Panchayat elections for which preparations are underway. The terrorist organizations are already intimidating the people and asking them to desist from voting.